Login to add reviews, pages or discuss trips. If you're not already a member, you may register for free. 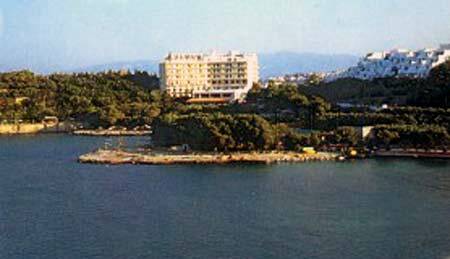 Mirabello Hotel & Village TENNIS RESORT is situated 2 kms from the picturesque fishing village of Agios Nikolaos, and 60 kms from Heraklion international airport. It is set in beautiful gardens in a superb location with a panoramic view of the bay of Mirabello and its surrounding mountains. The Mirabello Village is “de luxe” category and is built in traditional Cretan style, decorated with local tapestries and antiquities, creating a relaxed and friendly atmosphere. The Mirabello Village offers a choice of either rooms (39), bungalows (58) or suites (34) is available, all tastefully furnished, with air conditioning, bathroom, telephone, music, TV, refrigerator, balcony or terrace, and the majority of them with sea view. The Mirabello Hotel is class A and has 164 rooms and 10 suites, with air conditioning, heating, private bathroom, telephone, music, balcony and sea view. Mirabello guests enjoy the easy phase of life and the friendly, informal atmosphere found within the complex. CHILDRENS FACILITIES AND SERVICES Children’s Paddling Pool, Play Ground, Baby Sitting, Early Supper, Day Time, Activities. SOSIAL ACTIVITIES AND ENTERTAINMENT Cretan Evenings with local music and dances, B.B.Q. Evenings, Funny Games, Contests and other activities are organized on a weekly basis for your holiday entertainment. Είστε ιδιοκτήτης ή διευθυντής στο MIRABELLO HOTEL & VILLAGE - TENNIS RESORT; Εγγραφείτε τώρα για δωρεάν εργαλεία, που μπορείτε να χρησιμοποιήσετε για να βελτιώσετε την καταχώρησή σας και να συνδέσετε την ιστοσελίδα σας και το σύστημα κρατήσεών σας. Only registered Holiday members may write reviews. Register.